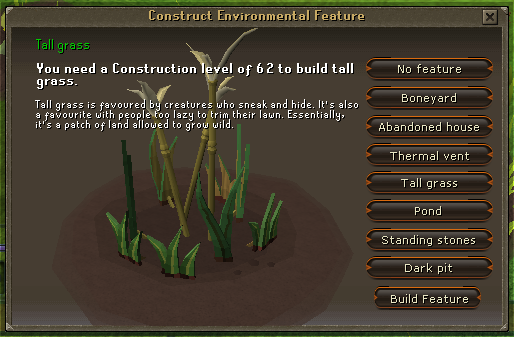 Herblore Habitat is a piece of mid to high level content, located at the very bottom right corner of Karamja Island. 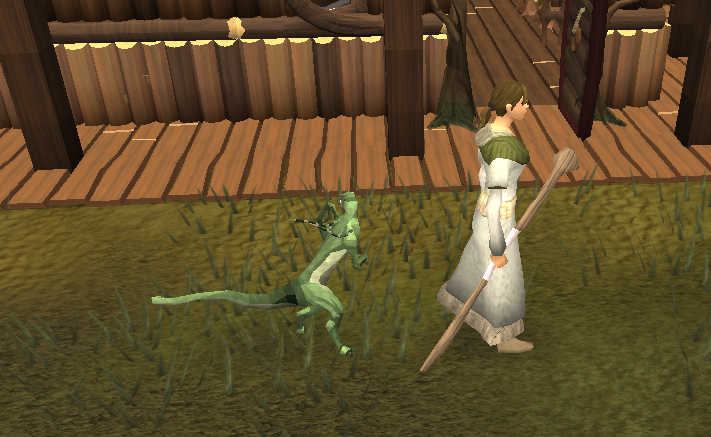 When you first arrive, 5 farming patches, a huge variety of new seeds, strange lizard creatures and a man slightly touched in the head wildly waving a Voodoo doll on a stick may be daunting - but like anything, once you have your head around it, you'll come to release Herblore Habitat is a very great piece of content. So drop everything (including that Juju Spiritbag) and let's save Rock and Roll. 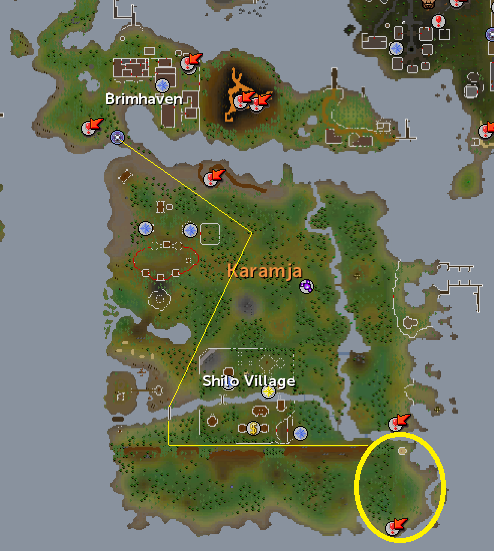 Herblore Habitat is located at the very bottom of Karamja Island. The easiest way to get there is via a teleport from either the Juju Spiritbag, or the Witchdoctor Mask, which you will unlock for working in the Habitat. Juju Spiritbags can be purchased for 2,000 Coins each from the Druidess Bettimax near the Taverly bank, and will teleport you directly to Papa Mambo. Juju bags are single use (much like Teletabs) whilst the mask has infinite teleports. The Habitat is made up of 3 main sections, and a small island to the east. The North section contains Papa Mambo, and this is where Common, Amphibious and Draconic Jadinkos will spawn. The Centre section contains the Farming patches, a Tool Leprechaun, a Compost bin, Astlayrix, and a Zombie Farmer who will look after your patches for you. The South section contains a Deposit box, an entrance to the Jadinko Lair (which must first be unblocked from the other side) and this is where Igneous, Cannibal, Aquatic, and Carrion Jadinkos will spawn. This is also the area for tracking Shadow, Diseased, and Camouflaged Jadinkos. The Island can be accessed via climbing a vine found in the South section of the Habitat. Here is where God Jadinkos will spawn, and there is also a second Vine Herb patch here. Make sure you have enough Inventory space if you are picking Herbs, as there is no leprechaun here to note them for you. Papa Mambo is the man who runs the Habitat. He's a bit odd, but don't fear - All he does is stand there shaking whatever it is he's holding. Papa Mambo can build Jadinko Habitats for you if you lack the Construction level (for a price) and also sells many essential items needed here. The plants you plant here will determine which Jadinkos will spawn for your hunting needs. When a certain combination of Vine blossom, Fruit tree, Bush and Habitat is met, Jadinkos will begin spawning in their various locations. The plants need not be fully grown, because as soon as they are planted they will begin attracting Jadinkos. Here's a show of all the plants. Vine Blossoms are the simplest of plants in the Habitat, and come in 3 colours. The seeds are purchasable from Papa Mambo for 50gp each, and can also be obtained in the Jadinko Lair and hunting Jadinkos. Vine Blossoms become diseased incredibly easily, and must be treated carefully. They take a relatively short time to grow. If you realise you've planted the wrong Vine Blossom, you can dig it up with a spade, or pick it once it is fully grown. 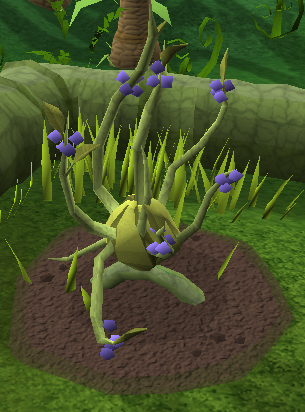 You may plant any Fruit tree you like here at the Herblore Habitat patch, but only 3 are useful for catching Jadinkos - Banana, Apple and Orange. These act like they normally would, and the Zombie Farmer accepts the same payments as usual. There are 2 types of Vine Bushes - Lergberry, and Kalferberry. These seeds are a bit harder to obtain than Vine Blossom seeds, as you cannot buy them, but must get them from hunting Jadinkos and working in the Jadinko Lair. These take a bit longer than Vine Blossoms to grow, and can also be dug up with a spade, or cleared once fully grown. 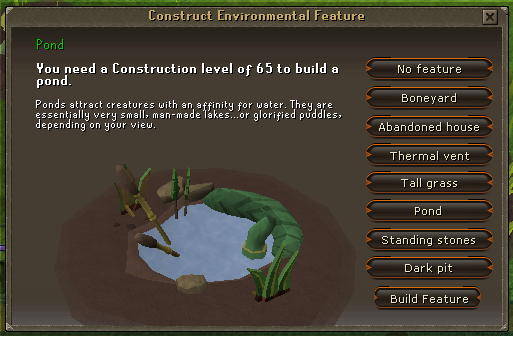 Habitats are made with the Construction skill, instead of farming, and their only use is for attracting Jadinkos. Each Habitat has a certain Construction requirement, and they can be made on the spot, at any time, free of charge, and changed however often as you like, as long as you have the Construction level. If you don't, Papa Mambo will build it for you, but for a price, which increases as the level required for the Habitats go up. 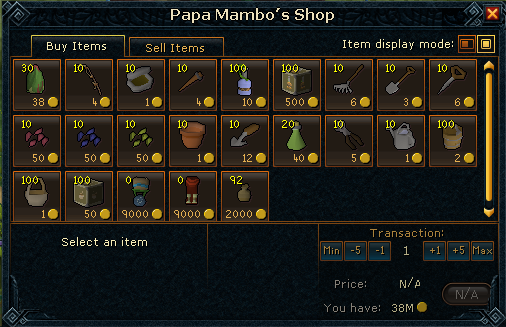 The price Papa Mambo charges is the Construction level required x1000. Vine Herbs are not used for attracting Jadinkos, but are used in Juju Potions. These will be explained later. Vine Herb Seeds can be obtained in the same way as Bush seeds - hunting Jadinkos, and working in the Jadinko Lair. Vine Herbs work like regular Herb patches and are affected by Juju Farming potions. Jadinkos are caught using the Hunter skill, and can yield very satisfying XP rates. Draconic Jadinkos are often hunted up to level 99, and even further. They are caught in Marasamaw Traps, which are basically re-skinned box traps and can be purchased from Papa Mambo for a very cheap price. The trap will close like a flytrap around the Jadinko if it is a successful catch, or the Jadinko will slither out and the trap will wilt if not. 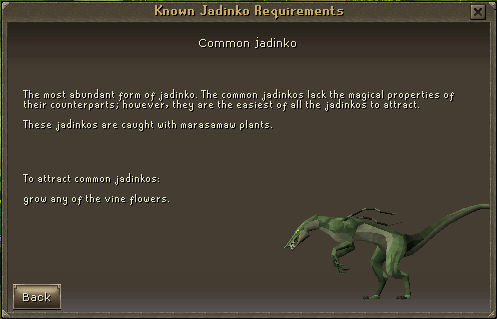 Common Jadinkos will yield a 100% loot of Withered Vines, which can be used to bait Marasamaw traps and increase your chances of a successful catch. These Jadinkos give 350 XP. Igneous Jadinkos will yield a 100% loot of Marble Vines, which are an ingredient in Juju Farming potions. These Jadinkos give 465 XP. 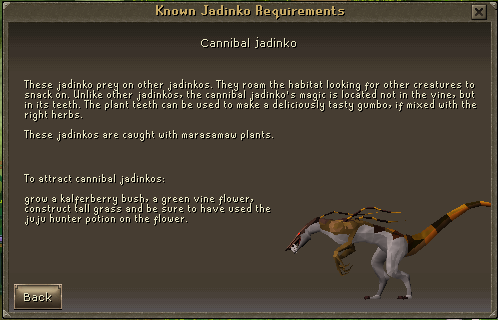 Cannibal Jadinkos will yield a 100% loot of Plant Teeth, which are an ingredient in Juju Cooking potions. These Jadinkos give 475 XP. 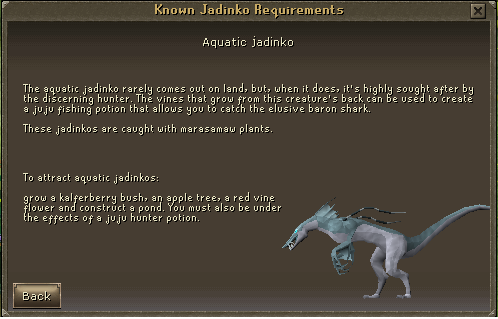 Aquatic Jadinkos will yield a 100% loot of Aquatic Vines, which are an ingredient in Juju Fishing potions. These Jadinkos give 475 XP. 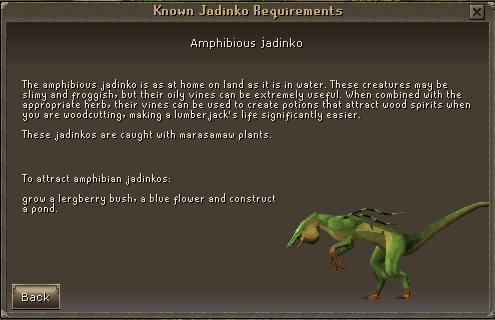 Amphibious Jadinkos will yield a 100% loot of Oily Vines, which are an ingredient in Juju Woodcutting potions. These Jadinkos give 485 XP. Carrion Jadinkos will yield a 100% loot of Pungent Vines, which can be used to bait Marasamaw traps, and can also be used to make supercompost. These Jadinkos give 505 XP. 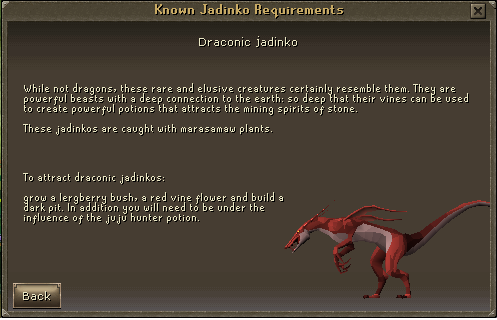 Draconic Jadinkos will yield a 100% loot of Draconic Vines, which are an ingredient in Juju Mining potions. These Jadinkos give 525 XP. 3 Types of Jadinkos are instead caught via tracking with a Noose Wand, which should be on your toolbelt. If you somehow don't have one, Papa Mambo will sell you one. 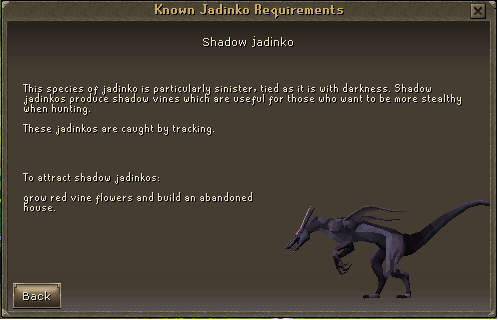 Shadow Jadinkos will yield a 100% loot of Shadow Vines, which are an ingredient in Scentless potions. 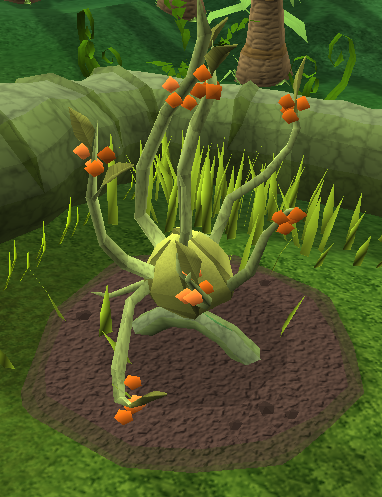 Diseased Jadinkos will yield a 100% loot of Corrupt Vines, which are an ingredient in Juju Hunter potions. 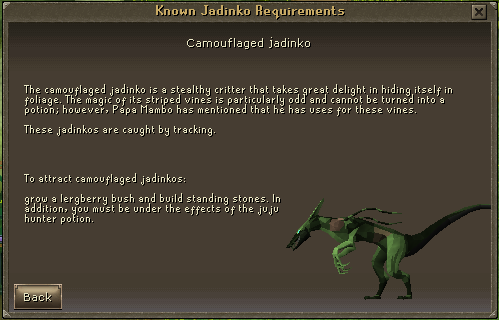 Camouflaged Jadinkos will yield a 100% loot of Striped Vines, which can be given to Papa Mambo in exchange for him stopping a group of Jadinkos spawning (even with the correct combination active) for 15 minutes. 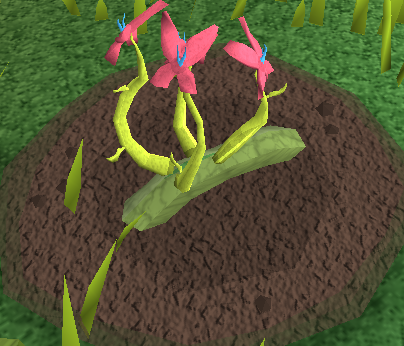 This is commonly used for warding off Common Jadinkos while hunting Draconics, as they steal your traps and give less XP. If you capture all of the above Jadinkos at least once within the same week, you can claim an small XP reward in either Hunter, Farming or Herblore from Papa Mambo, and he will also reward you either the Witchdoctor Robe or Legs. Be warned, he can give you doubles, so It may take more than 2 weeks to get both pieces. 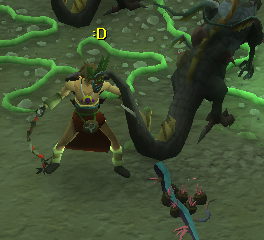 The Witchdoctor gear acts like camouflage in Herblore Habitat, so whenever you are hunting there, wear it. 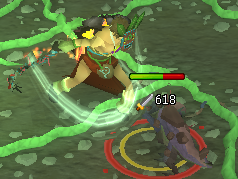 If you catch all 3 God Jadinkos, Papa Mambo will add an XP boost to your Witchdoctor pieces in HUnter, Farming, and Herblore, while working the Habitat, for 30 minutes. The Mask and Robe give 2%, and the Legs give a 1% boost. 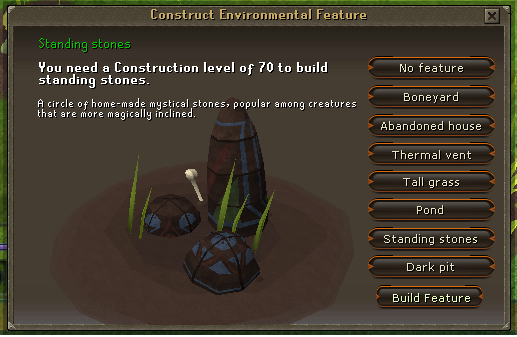 Juju potions are the main reward you earn out of Herblore Habitat, as they are the only rewards that have a use outside the Habitat. Each will give a certain boost to a particular stat - however, none of them are combat related. Although some potions do have abilities which can aid your combat later on. Juju potions are made in special vials which can be purchased from Papa Mambo. Each requires a certain Herblore level to make. Requires 1 clean Erzille, and 1 Corrupt Vine. This potion is necessary to attract certain Jadinkos. 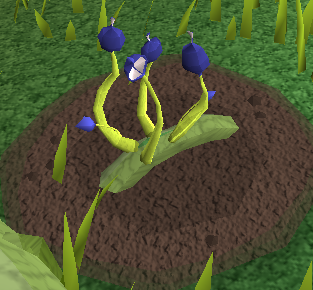 It is not consumed by the player - it is tipped on the Vine Blossom patch instead. Requires 1 clean Argway, and 1 Shadow Vine. This potion will mask your scent and increase your chances of successful trap catches for a period of time. Requires 1 clean Ugune, and 1 Marble Vine. After drinking this potion, every time you pick from a Herb patch, you will have a 33% chance of receiving two Herbs instead of one. This works on normal and Vine herbs. Requires 1 clean Shengo, and 1 Plant Teeth. This potion is used to make a high-healing food called Juju Gumbo. Requires 1 clean Shengo, and 1 Aquatic Vine. After drinking this potion, every shark you catch will have a 33% chance of being a Baron Shark, another high-healing food. Requires 1 clean Samaden, and 1 Oily Vine. After drinking this potion, every set of Logs that you cut will have a 10% chance of spawning a Wood Spirit, which will bank logs for you automatically for 30 seconds. Requires 1 clean Samaden, and 1 Draconic Vine. After drinking this potion, every ore that you mine will have a 10% chance of spawning a Stone Spirit, which will give you a 10% XP boost, and also has a chance of smelting ores into bars on the spot, yielding full smithing XP, for 30 seconds. Use your Juju Cooking potion on a baked potato. This will yield a "strange potato". Use a bowl on a cooked Tuna. You will need a knife for this, toolbelt or inventory. Use a cooked Sweetcorn on the resultant chopped Tuna. Use the strange potato on the resultant Tuna and Corn. This process requires 67 Cooking. Baron Sharks are a high-healing food which you can fish up using Juju Fishing potions. They can be cooked with level 80 Cooking. When consumed, they will heal 1600 lifepoints, and then continue to heal you 50 lifepoints per second for 10 more seconds, totalling 2100 lifepoints per inventory slot. If you wear a Shark's tooth necklace, a reward from the Fishing Trawler, this effect will last 5 seconds longer, totalling 2350 lifepoints per inventory slot, which turns out to be the highest ingame. These Jadinkos are very special, in that the combination required to attract them changes every week, and you must find it out for yourself, as it is random for every player. You will receive hints in your chatbar as you discover more correct plants needed to attract the god Jadinkos. However, AT ALL TIMES, you must have a Juju Hunter potion active. Even if you have the correct combination, without a potion they will not spawn, and you may not even get hints. A good strategy is to plant a Fruit tree, a Bush. a Vine Blossom, and then begin cycling through the Habitats. If you do not get a hint, change the Vine Blossom and start cycling through the Habitats again. If not, try again with the third colour of Blossom. If you still haven't got one, change the bush, and then try again with all 3 Blossoms. You should get a hint by now. If you've found 3 out of 4, change the Fruit tree until the god Jadinko spawns. Most weeks, all 3 god Jadinkos will be attracted by the same Fruit tree, but this does not always happen. Sometimes, they may prefer no Habitat, no Tree, no Blossom, or no Bush, so always try with an empty patch as well. Once you've spawned your first god Jadinkos, clamber over the vine to the island which is where the god Jadinkos spawn, catch as many as you would like, return to the Farming patches and begin the process again. 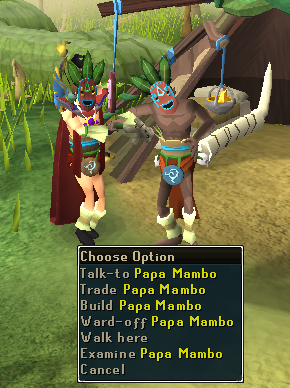 If you catch all 3 in the same week, Papa Mambo will award you the Witchdoctor mask, which has unlimited teleports to Herblore Habitat. No more paying 2k for Spirit Bags ever again. God Jadinkos require 81 Hunter to catch, and give 600 XP. 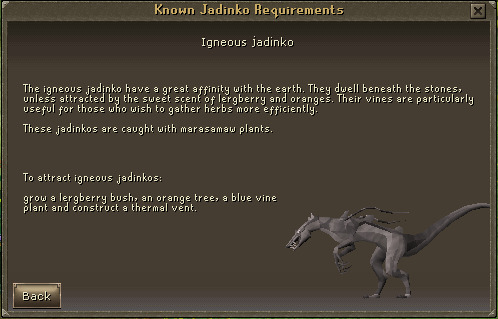 Saradomin Jadinkos yield Saradomin Vines, Guthix, Guthix Vines, and Zamorak, Zamorak Vines. All of these are used in their respective God Juju potion; Saradomin's Blessing, Guthix's Gift, and Zamorak's Favour. 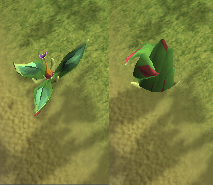 These potions require 1 clean Samaden and their respective vine, and give a 10% boost while working in Herblore Habitat to Farming, Herblore, and Hunter respectively. The Jadinko Lair is a cave underneath Herblore Habitat, which is basically the Combat, Firemaking and Fletching portion of the Habitat. 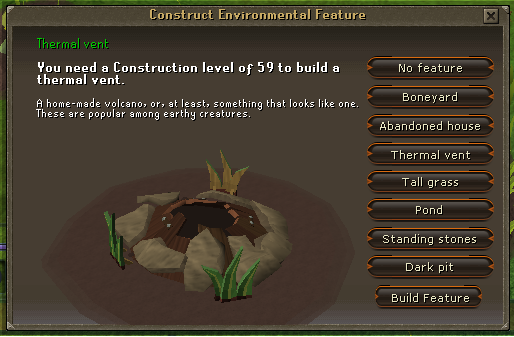 Here you can earn seeds in a vast amount, and also Firemaking XP at an eye-blurring rate, free of charge. 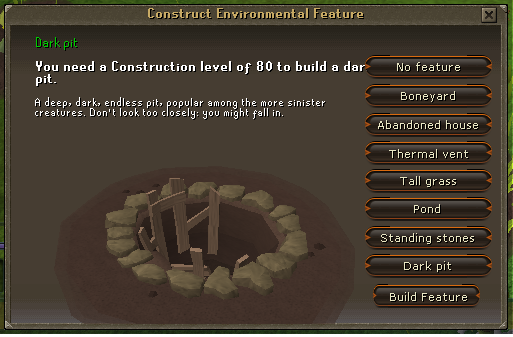 To access the lair you must first use the entrance just north of Herblore Habitat. Once inside, run directly south, and you will see a Large root. 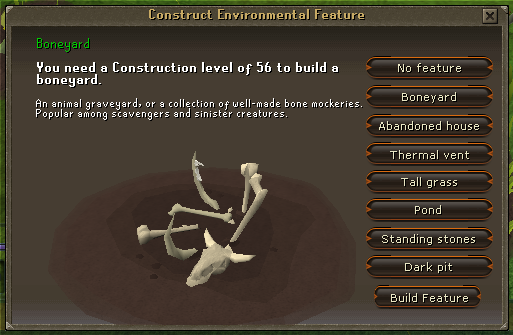 Clear this out with a hatchet and you will now have a shortcut from the deposit box in the southern section of Herblore Habitat to the Lair. Jade roots come in two variations - Straight, and Curly. Both require 83 Woodcutting to chop. When you cut a Jade root, you will first split off the outer protection of the root. You must then cut it again, and you will receive the items. Straight roots are used for fletching, while Curly roots are used for Firemaking. 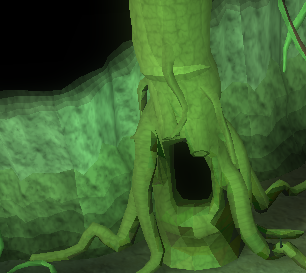 The Adze will burn roots as you chop them, earning you large amounts of XP. 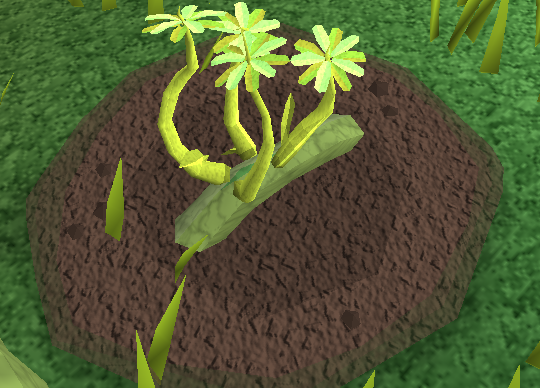 To train, you are filling up your inventory with Curly roots and then burning them all at once, so the adze will help you gain XP as you fill your inventory. The gloves and ring are essential, and there is no excuse to not have them, as your Firemaking level will be at least 83 and you will have gotten them at the same time as your Adze. The Pyrelord is considered by some too much of an effort to keep maintained, but it does give a 10 Firemaking XP boost per burn, which can boost up your experience/hour significantly. 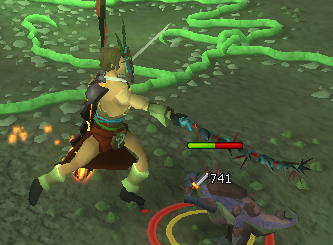 A good idea whilst training is to wield a bow or crossbow with no ammunition, so when you accidentally click on a mutated Jadinko, you won't attack it. 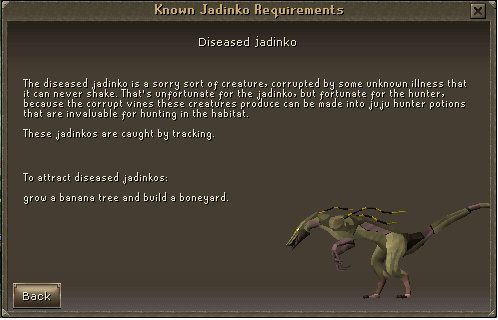 Mutated Jadinkos can be assigned by Slayer masters, and the Mask of Vines (a reward from the Squeal of Fortune) is aligned with these creatures. 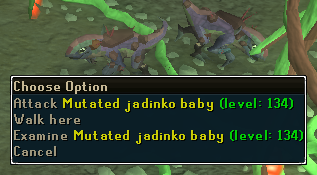 Mutated Jadinko Babies are level 134, have 3,350 Lifepoints, and are weak to Stab. You will earn 379.8 Combat XP and 125.3 Constitution XP per kill. They require level 80 Slayer and yield 98.6 Slayer XP while on task. 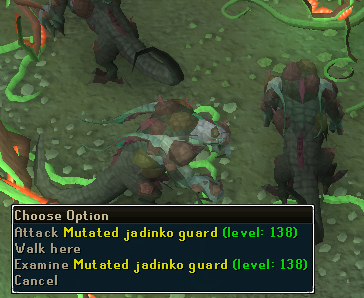 Mutated Jadinko Guards are level 138, have 6,000 Lifepoints, and are weak to Stab. You will earn 569.9 Combat XP and 188 Constitution XP per kill. They require level 86 Slayer and yield 188.4 Slayer XP while on task. Mutated Jadinko Males are level 144, have 6,000 Lifepoints, and are weak to Stab.You will earn 646.3 Combat XP and 213.2 Constitution XP per kill. 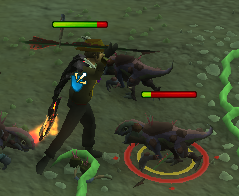 They require level 91 Slayer and yield 209.6 Slayer XP while on task. Mutated Jadinkos drop a various array of unique items, including Mutated Vines, and they also drop a stackable item called Excrescence. Two Excresence can be added to a Mutated Vine, which creates a Bolas. The Bolas is a level 76 thrown Ranged weapon that deals no damage, but binds enemies to the spot. Be warned, if you use the bolas in the Jadinko Lair, the Vines will whip out and begin attacking you. A Rare and Very Rare drop respectively from Mutated Jadinko Males and Guards is the Whip Vine. 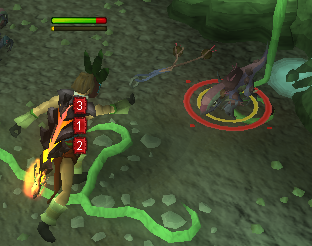 The Whip Vine is an item that can be added to an Abyssal Whip, which turns it into a level 75 weapon. This requires 80 Slayer. Killing Mutated Jadinkos, cutting Mutated Vines, and burning Curly Roots all earn you favour points. These favour points can be exchanged at the stone next to the queen for either Juju fruit (which act as food and have various passive effects - only Common fruit can be taken out of the Habitat), or for Juju seeds. You will receive Blossom seeds in an abundance, and various Bush and Vine Herb Seeds. You can only hold 2000 Favour points at a time - once you achieve that, you must spend them before earning any more. You can still train in the dungeon, however you won't earn favour points. Thats it! 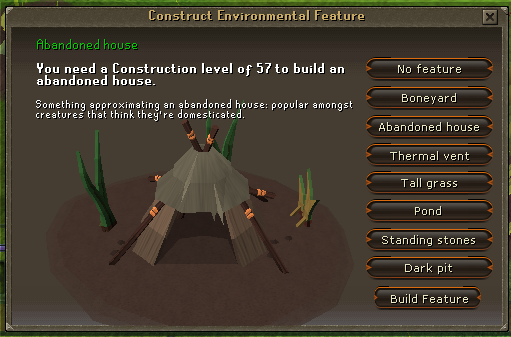 The Herblore Habitat. An enjoyable piece of content that will have you entertained and busy for hours on end. Whether it be that free 99 Firemaking, or Juju Farming potions for the avid Herb runner, there's something here for everybody.